The Large Combo includes 20 oz. 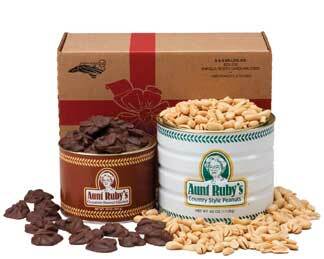 tin of Aunt Ruby's Chocolate Covered Clusters plus a 40 oz. tin of Country Style Peanuts. 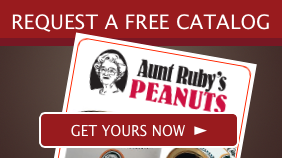 Calling all peanut lovers: Aunt Ruby's country style and honey roasted peanuts are THE BEST EVER! For several years now I have sent the Combo Gift Pack to my sisters in California, Indiana, and Arizona, and a brother in Indiana. I suggested that maybe I send a different gift if they were tired of the same gift year after year. There response was a resounding, "No, we look forward to getting the peanuts." "The chocolate covered peanuts are the best I ever tasted." And another sister said, "I actually hide them from my husband because once he finds them, he eats them all!"